Best brand, best prices. Select a brass socket and match it with a zinc-coated steel plug, or go STAINLESS for the ultimate fittings. NOTE: If you downstream strong cleaners, we recommend using all stainless fittings for durability. 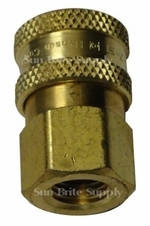 We also recommend using stainless plug fittings even with the Hansen brass sockets, as stainless fittings do not rust or dent and it is difficult to make them rough (which damages O-rings). We include some low-cost stainless plug fittings on the bottom of this page even though they are not made by Hansen.